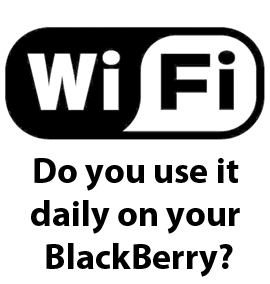 CrackBerry Poll: How often do you use the WiFi on your BlackBerry? I received an email from a reader recently looking for advice. Let's call her Rachel. Rachel's AT&T contract is expiring soon (she's actually been with AT&T for 8 years and hasn't had any issues with them) and was thinking about renewing as she really wants to get a BlackBerry Torch. However, Rachel was concerned that with a device like the BlackBerry Torch that AT&T's new 200MB and 2GB BlackBerry data plans don't provide enough data for her as she wants to be able to go BBM, Facebook and browse the web all day long without running into overage charges (she used to have the unlimited plan but turned it off a year ago when she went back to school and can only get the new plans now). With T-Mobile offering unlimited minutes/messaging and data for basically the same price, Rachel was starting to think she should make the switch to T-Mobile and settle on a Bold 9700 even though what she really wants is a Torch. What oh what to do?! My advice to Rachel began with a simple question.... do you have WiFi access where you live, go to school and work? While 200MB is plenty of data for many BlackBerry users and 2GB of data is likely plently for most BlackBerry users, including Rachel, taking advantage of WiFi hot spots where you spend the majority of your time can greatly eliminate your data concerns. This is especially the case on BlackBerry 6 where you don't have to toggle between Hotspot browser and Internet browser anymore - if you're on WiFi, you're using WiFi. It turns out it never occured to Rachel that she could use WiFi on the BlackBerry Torch, and that she does in fact have WiFi access at home, work and school. Decision made, Rachel is definitely getting the BlackBerry Torch she wants. My last bit of advice to her was to pick up a spare battery - heavy WiFi use can eat up the battery life a bit. I have a feeling a lot of BlackBerry owners out there are like Rachel - either not realizing they could use the WiFi on their BlackBerry or just not using it as effectively as they can. Vote on the poll above and let us know where you rank. And remember, if you do want to save on your monthly bills, going for the cheapest data plan and maximizing your WiFi use is a good way to save.